November 8th, 2007 : Partly Sunny and very cold, Water Temp 57* and slightly stained. Picked clients up and went and caught bait. Set out a spread of 10 Planner boards, a bobber and a free line on a shallow flat and worked my way toward deeper waters of no more than 20'. We had two hits on a point and boated 1 Striper and for the next hour we got hit about once every 10 minutes. The fish quit hitting when the sun went in behind the clouds and when it was out the fish would turn back on again. 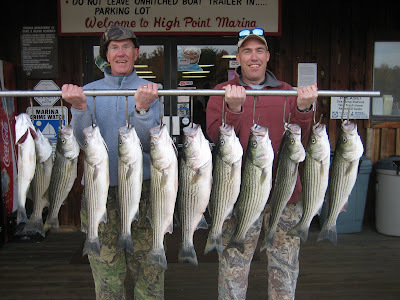 Clients kept 12 Stripers that weighed well over 80 pounds. We also saw 2 very large schools of Stripers breaking on the surface, one school well over an acre in size. These fish are just starting to feed up for the winter, their belly's small and their appetites Big.